Cloud County and Republic County in north central Kansas are home to a rich history of immigrant settlers from all over Europe. Like the settlers of New Scandinavia, or present day Scandia, many of the immigrants who called Republic County home were of Swedish or Norwegian descent. In 1865, four years after Kansas became a state and one year before New Scandinavia was founded, the United States census recorded 204 Swedes living in the state. Remarkably just 25 years later the census of 1890 recorded 17,096 Swedes in Kansas alone. This explosion of interest was in fact due to very calculated campaigns, advertisements, and official actions made by the federal government and it came about at a time when some Europeans were looking to relocate. In 1864 the Kansas Bureau of Immigration was formed, which generated promotion for the state, hoping to attract new residents from Europe. The bureau combined with the Homestead Act of 1862 attracted many settlers to Kansas, including the Swedish, Norwegian, Dutch, French, and Czech immigrants that settled in Republic and Cloud counties. The act allowed them to settle land in Kansas and other territories in the west. They could claim 160 acres of public land by living there, building a permanent home, and growing crops for five years; or they could simply purchase the land from the government for $1.25 per acre after living on the land under the same circumstances for six months. This was an attractive deal to immigrant families who were often working for low wages in large cities like New York or Chicago. The promise of land ownership was a dream they simply could not have realized in their home country or in their newfound industrial cities here in America. J . R. Sandell arrived in Republic County, Kansas, with nine other men on a crisp fall day in 1868. As members of the Scandinavian Agricultural Society of Chicago, they had traveled from the city to settle new land, which they would name in honor of their heritage—New Scandinavia. It was just one year later that Sandell would open the first store in town, with many more soon to follow. It was a fresh beginning for these immigrants, who would create a lasting community, rooted in their Scandinavian ancestry. 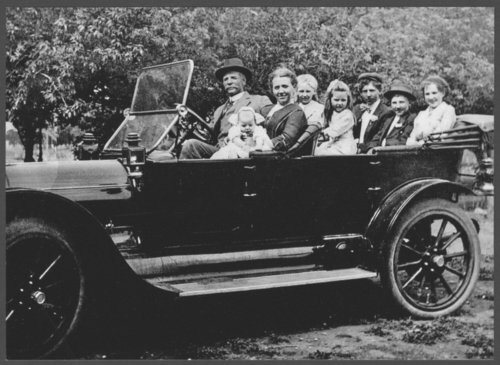 While Scandia was founded primarily by the group of Swedes living in Chicago, there were also immigrants moving to Kansas and other Midwestern states directly from Sweden, Norway, Denmark, and other European nations. The great famine of 1868 in Europe was a driving factor for many of these immigrants. Much of Scandinavia had suffered through several years of poor harvest. After hearing of the affordability of Kansas from their friends and relatives, many opted to make the move to America, rather than wait out the famine in their homeland. Making the move to Kansas was not an easy decision for many of these immigrants. Whether relocating for a second time from a larger U.S. city or coming directly from Europe, they often struggled to adapt. The wide-open prairie, with ample farmland and opportunity for self-sustainability, did not resemble northern Europe and the adjustment often took time. Immigrants took solace in communities like Scandia, often made up of many people who shared a common heritage. Church services held in their native languages, along with the opportunity to own land and provide for their families, made their lives in Kansas worth the transition. These families created new towns abundant with new traditions that live on to this day. Walking through the modern town of Scandia, the history of New Scandinavia lingers in the dala horse decorations, and is felt in the architecture of the Amana Lutheran Church, a remnant from the past that remains active in the community. It is a compelling story of how immigrants found their home in the new world in Kansas, and how their traditions left a lasting mark on many communities in our state.